Hey, folks are you eagerly searching for ways to import OLM files from Mac environment to Windows Outlook environment? If such is the case, you are in the right place. As we all know, Microsoft Outlook is the world’s top-rated email client – for both Windows and Mac OS users. 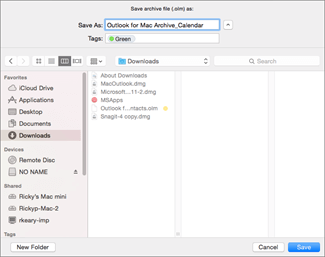 In MS Outlook 2019, 2016 & 2013 and Outlook 2016 for Mac emails, can be exported to archive files. The data is saved in PST file format in MS Outlook, and OLM file format in Outlook for Mac. And these data files can be imported to (different versions) MS Outlook. OLM emails to need to be shared with co-workers who are using Windows systems. 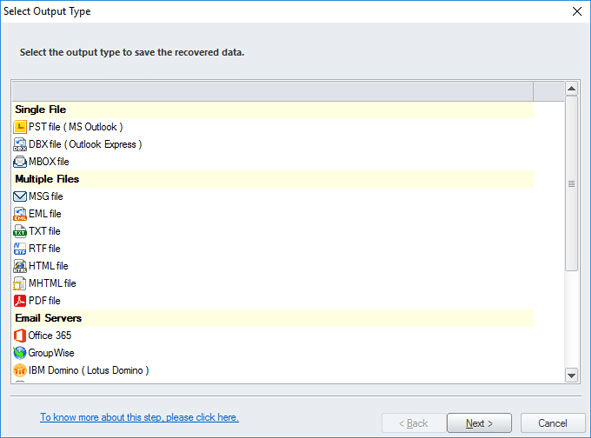 No direct ways to make Outlook for Mac emails available in Windows Outlook. Employees use Windows and Mac systems at different locations. 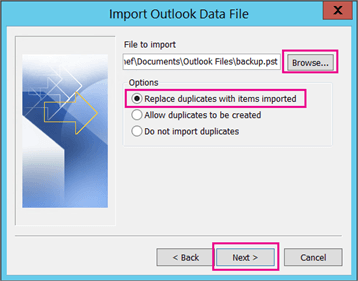 A simple step-by-step guide is here to take you through the import process of Mac Outlook OLM files into Windows Outlook 2019, 2016 & 2013. STEP 1: Click on Tools tab, select Export option to export Outlook data to OLM file format. Please Note: Don’t see the Export button? Make sure you have the latest version of Outlook. 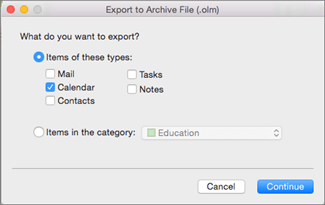 STEP 2: In the dialog box Export to Archive File (.olm), select the items you want to export (from Mail, Tasks, Calendar, Notes, and Contacts), and click Continue. STEP 3: Now, from the Save Archive File (.olm) as dialog box, look for Favorites in the left pane, choose Downloads folder, and click Save. STEP 4: Finally, your data will be exported, and you’ll get a notification. Click Finish to complete the final step. For importing the OLM file data to Windows Outlook, you will first have to convert the OLM to Outlook PST file format. 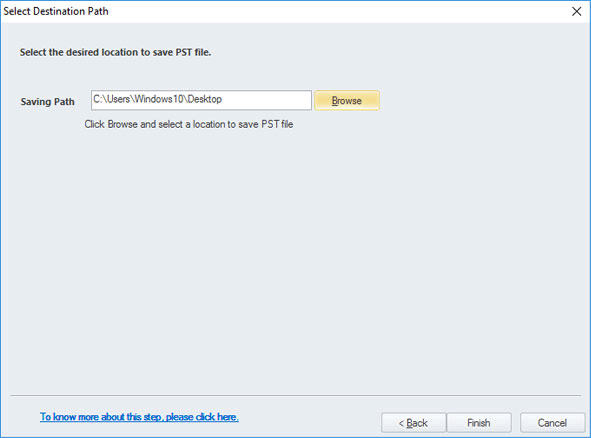 Then, the converted PST file can be successfully imported to Windows Outlook. The best solution for performing the conversion is an automated third-party tool. Hence, it is recommended to use Kernel for OLM to PST Converter tool. STEP 1: Launch OLM to PST Converter tool and then select Browse button to select a source OLM file that is to be converted to PST file. Note: If you wish to convert multiple OLM files at one time, select Convert Multiple Files and add with the help of the + button. Click Next to move to the next step. STEP 2: To make yourself satisfied with the data that is present in the OLM file for conversion, you can preview that before conversion as shown below. 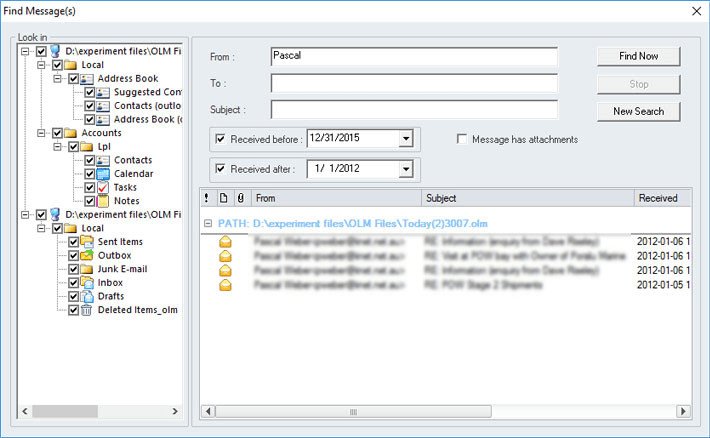 Now, click PST file (MS Outlook) from the right panel of the software. Note: You can save individual items by selecting the required format from the right-click menu. Note: To find specific messages, click the Find button on the toolbar. Now, search for specific items in the Find Message(s) window. 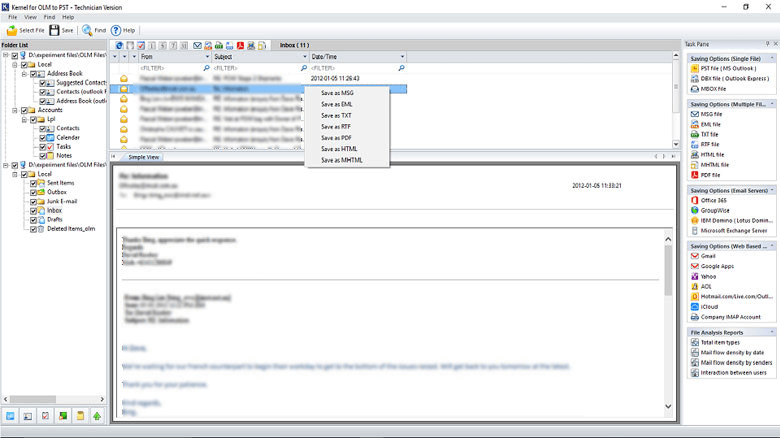 STEP 3: Now, select the Output type as PST file (MS Outlook) and click Next to proceed with the conversion process. STEP 4: Opt for smart filters just in case you want to save specific items. This is an optional filter. You can simply skip the step and move ahead to save the complete data to PST file. STEP 5: Save the converted PST file into multiple PST file if you realize that it is very large. 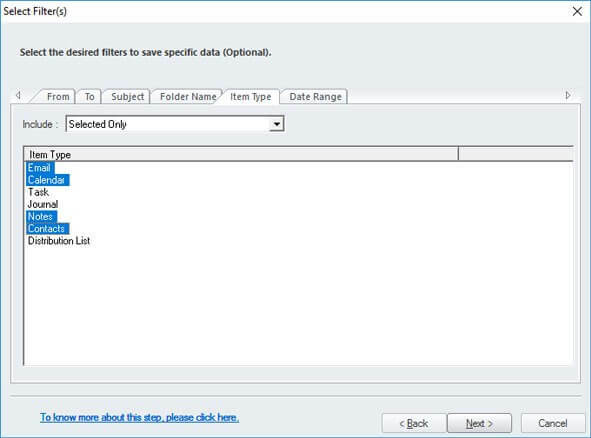 Otherwise, simply select Do not split file option to save the entire data to a single file. STEP 6: Finally, select the destination to save the converted file using the Browse button and click Finish. 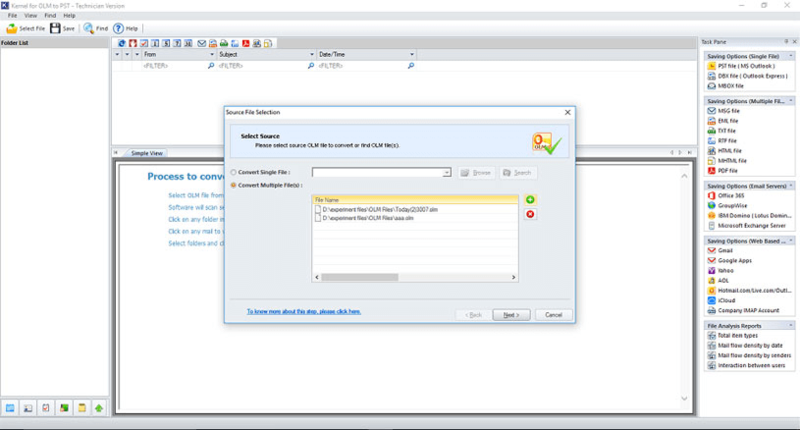 STEP 1: Open MS Outlook and select File. STEP 2: Select Open & Export >> Import/Export. STEP 3: In the Import and Export wizard, select Import from another program or file, and then click Next. 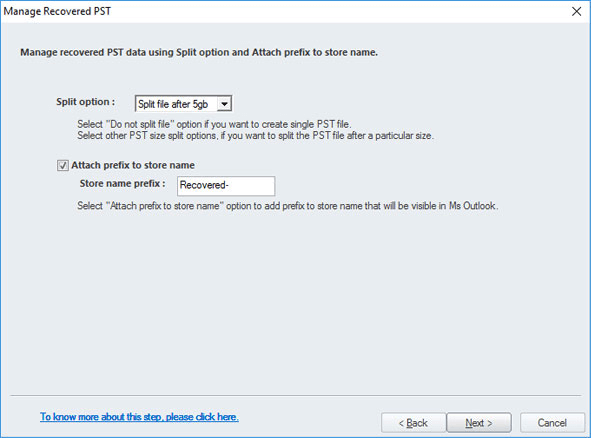 STEP 4: Now, select Outlook Data File (.pst) and click Next. STEP 5: Select the file to import by clicking on the Browse button; under Options select the suitable option and click Next. STEP 6: Atlast, select Import Items into the current folder and click Finish. 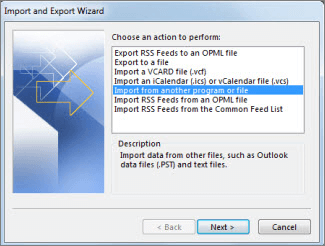 The steps for importing OLM files to Windows Outlook is given here for you. Simply perform the steps and transfer emails, contacts, calendars from Outlook for Mac to Outlook. 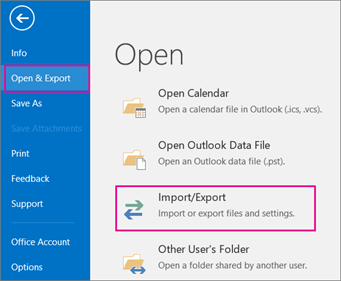 Also, you can take a look at the steps to Export OLM to Office 365 Manually.